This is a fantastically-located, 3 bedroom apartment, which is only five minutes on foot from Plaça Catalunya and Las Ramblas. There are plenty of bars, restaurants and cafés, surrounding the apartment, as well as supermarkets and shops. 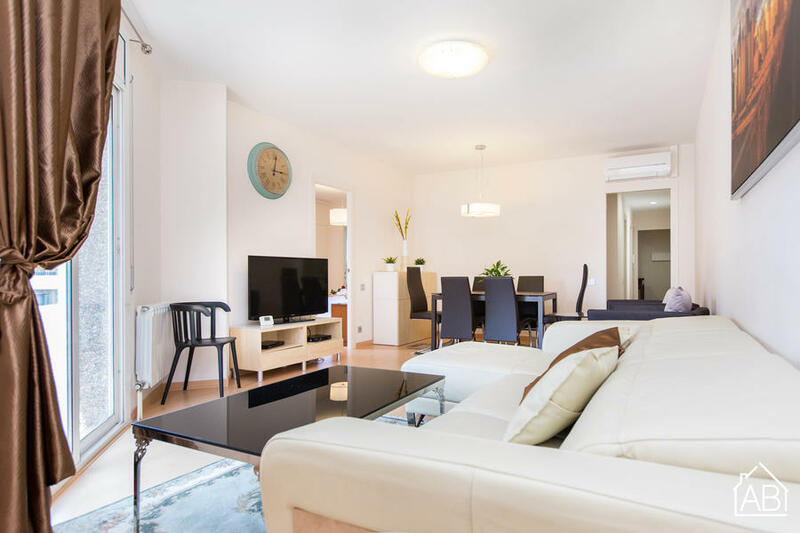 Thanks to the central location of the apartment, guests are in the ideal position to explore Barcelona, and it is also well connected by bus and metro to all of the city´s sights. This conveniently located apartment has a comfortable chaise longue sofa in the living room, as well as a dining table and access to the balcony. Satellite TV, DVD player and an Internet connection are also available. There are five single beds and one double bed distributed throughout the three bedrooms, and there are two bathrooms, both with walk-in showers. The kitchen is modern and fully equipped, providing guests with all the utensils and appliances needed to prepare home-cooked meals. There is also a washing machine, dryer and dishwasher for your convenience. There is a parking space available for this apartment. PLEASE NOTE: Late check-ins between 21h and 24h have a supplement of 30 Euro, and from 24h to 02:30h the supplement is 50 Euro. Check-ins after 02:30h are not accepted. The deposit is 303 Euro and is only payable by card. Please note: There is a parking space available for this apartment at a price of 20 EUR per day.